When I first saw one of these I thought it was some kind of fake. A coloured Martin! And in red, green or blue!! Surely that should be "Martin Smith" or something? Surely they can't be faking the logo that much again? Surely something odd?!? Anyway I checked it out and it is legit! 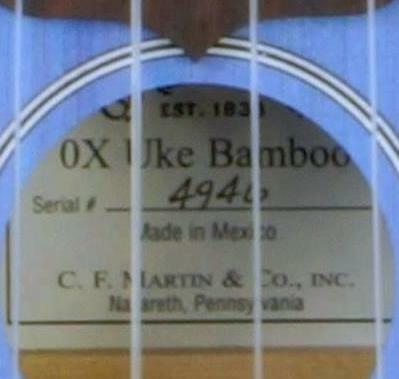 One of Martin's 2015 special limited editions is in the 0X series and is a laminate Soprano in three colours and made of Bamboo, (Bamboo is always laminate you don't get strips big enough to make anything from a single strip; but the technology is well proven, see the Vamboo for another example; and as a material it has very "green" sustainable credentials). Colour is a bit of a departure for Martin but they had already broken the laminate taboo for the 0XK so why not? So Martin are doing a Budget(?! ~ only for Martin would you call it budget), colourful Soprano! Now I'm a sucker for colourful Sopranos, (along with many other things), so I wondered how much? After all it's very different from the normal Martins, it's a limited edition so production will stop soon, and like the old backpacker, which were very different at the time and they are now unavailable have become something of a cult Ukulele, I predict this one is likely to too in a few years. And, (and I'll remember how much under the asking price I went because they are a high end supplier so I may try again now as), my offer was accepted! I wonder if this one will smell like the Vamboo did when it was new?